Any knitter knows how hard it is to find good patterns for toddler sizes. Debbie Bliss fills this gap with 32 original patterns, ranging from the tradition of arans and fair isles to the trendiness of western and Chanel-inspired designs. The difficulty levels range from basics even a beginner could complete, to expert, which would challenge the most experienced knitter. 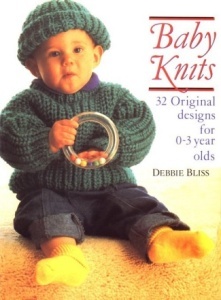 If you knit for small kids, you GOTTA have this book!